When Celia started sharing with us what is new in her kitchen each month I am sure she had no idea that over 40 people would link up to Fig Jam And Lime Cordial to show what is in their kitchens. I must say that this last month I have not had the time to pop in and see what everyone displayed. My time was rushed with planning our overseas trip and making sure that my work was all up to date, and that my blog had posts on it. in my kitchen November 2013 …. are three more espresso mugs. I got these when I spent a voucher that was a part of a goody bag from a bread making course I was invited to. I now have 7 of the 8 I want! 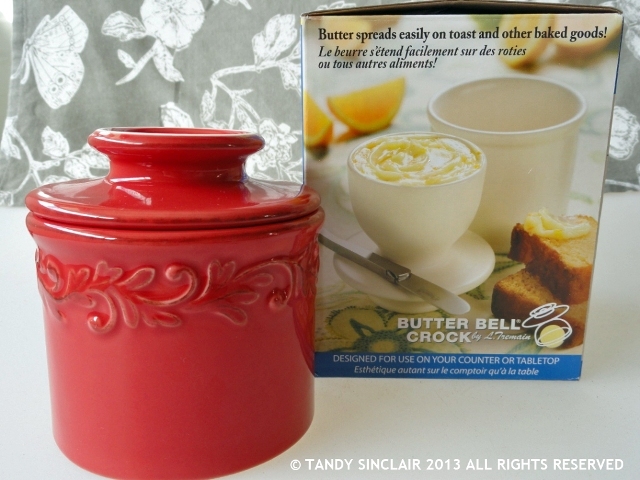 is a Butter Bell® butter crock which has been sent to me for review. This came about after I posted about my Le Creuset butter crock. This is a task for November! And, that is it! I have nothing else to share with you this month. Just short and sweet. I’m really interested in that butter bell. It’s hard to imagine keeping the butter on the bench (as I’m guessing you do) as we both know how hot the summers get at this end of the world. But, if it does the job, well maybe I can be converted! Thanks for joining in despite your busy schedule. They are fun to collect! Beautiful mug colors. I love collecting espresso mugs/cups! Those espresso mugs are beauties, love the colors! I like you cute espresso cups…nice that your collection is almost complete. It is so lovely peeking at what other people have! G’day Tandy and thanks for your kitchen view! I have been reading up on Butter Bells and looks like one will be coming my way soon too! A short and sweet peek into your kitchen Tandy!! 😀 That butter bell is very cute. 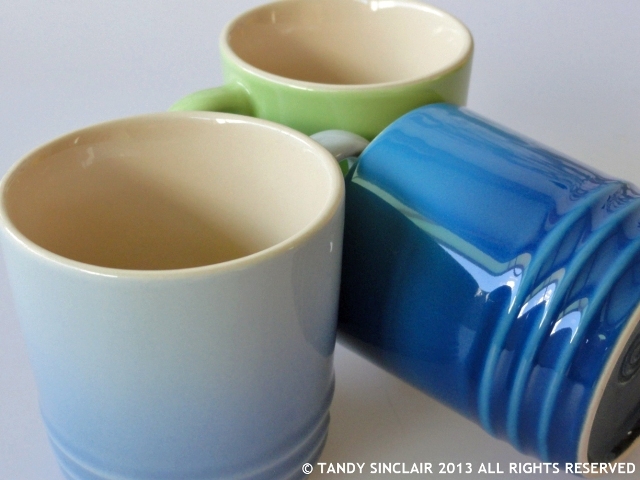 Hi Tandy- fun post- short and sweet with those pretty cups and butter dish!Hope you had a great trip! I just got the same butter bell. Pretty mugs! Short and sweet is good, too! Tandy, short and sweet indeed! Love the butter crock! Happy cooking! How come I am missing your posts!? I have not changed any settings so I am not sure why you are missing them! Love the colours and shape of your espresso mugs. The butter crock is too cute! Good luck with your trip!! I´m planning mine to Amsterdam, Berlin etc on January, so I know it´s hard work! How exciting you only have one more espresso mug to go Tandy. We have 4 and when Pete is home, they are in permanent use with his love of his new Nespresso coffee machine. I considered getting one of those machines for work! Both the cups and the crock are so cute! What a pretty butter bell! I guess I should get back in the swing of posting WIMK monthly posts again. It would be nice to see what is happening in your kitchen!